BoE flipping is a market that you typically need to spend some time in before you find the best approach. I have been fine-tuning my multi-realm setup in this market for a while, and it’s about time to revisit it to look at what I am currently doing. What did I write the last time? In my last post on BoE flipping i was very focused on the Dazar’alor BoEs. I focused on two important factors which is item level and sockets. Generally you want to focus on 400+ unless the item has a socket, in which case 385+ s pretty good. My basic setup has essentially remained the same since Legion where I buy items using search strings where I use the region market average as the base price and then I post them based on a realm specific percentage of the region market average. My TSM setup has 80% dbregionmarketavg as the minimum price, which means you should not buy items above 60% dbregionmarketavg. The general outline in how to identify deals is essentially the same. We want a minimum profit margin of 20% and we want to buy items where there is a significant gap up to the second cheapest item of the same item level. The biggest change I have made since the last post is to add the world drop BoEs to my repertoire. Specifically the weapons and trinkets, which do not have competition in the i350+ range at all. To buy these I now run the shopping string to return all items above item level 350. It’s a bit inefficient in the beginning as you will have to mouse over items until you learn the names. For items below 385 I only look at weapons and trinkets, and I generally only buy them if they are item level 355 or higher. The item level 350 versions are generally much too abundant, and I can almost never find deals for that item level outside of very low pop realms. As I said above my basic setting is 80% dbregionmarketavg as the minimum price. Price levels for BoEs will have fairly large differences between realms however, so I now have separate profiles and settings for each of my realms. My minimum price varies between 50% and 110% dbregionmarketavg. Generally I want it at a level where I can find 1-5 deals per day and I want a profit margin of at least 20%. I use the results pane sorted by region market to get a decent idea of how the price is relative to the region market average price. WeakAuras is one of the most powerful addons in WoW. It is mostly used for PvE to display important information in a way that lets you simplify decision making. I’ve recently started using it for my Multi-realm BoE flipping setup. I made a very simple aura that just displays my minimum, normal and maximum prices for BoEs with numbers in big red letters. This lets me very easily compare the prices of items to my minimum posting price to save time when looking for deals. It saves me a lot of time and mental effort as I can now just focus on the right deals. You can get the import code below if you want to add something similar for yourself. 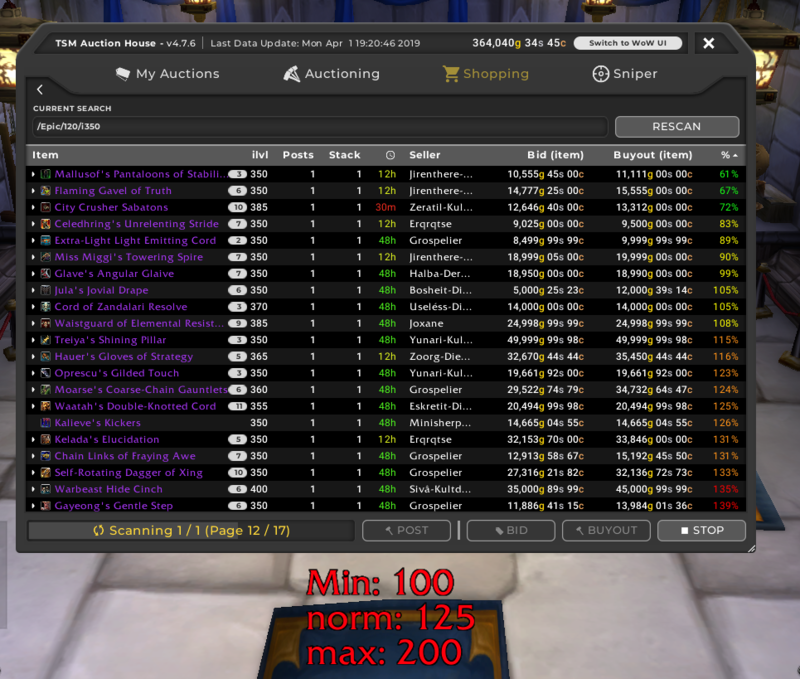 Set the source to dbregionmarketavg and you can now use the percentage in the rightmost column when doing a /Epic/120/i350/ search as a basis for decision making by comparing it with the minimum price displayed by your WeakAura.